WHITING, Ind. – Driving under the arch here welcoming you to the Downtown Business District, you are transported back in time as 119th St., lined with quaint buildings, restaurants and shops, conjures up a nostalgia for a walk down Main Street in Small Town, USA. But turn right on Schrage Ave., and you’ll find another so-called relic from days gone by: a raging class battle. However, this struggle could go even further back in time to when David fought Goliath. Hoping for the same victorious outcome are the Davids and Davidas of the United Steel Workers in their fight with the largest Goliath of the U.S. economy: Big Oil. 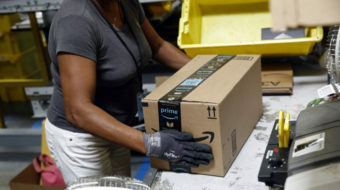 Steelworkers here went on strike Feb. 8 at the BP-owned refinery, a sprawling complex that sits on the edge of Lake Michigan and crosses the boundaries of at least three small cities in northwest Indiana: Whiting, Hammond and East Chicago. Their brothers and sisters in Toledo, Ohio, also went out on the same day at the BP refinery there. They are the latest locals to join the largest strike of U.S. oil workers since 1980. On Feb. 1, the USW was forced to go on strike at nine refineries in Texas, California, Kentucky and Washington State, after Shell Oil Co. broke off negotiations with the union less than two weeks after they began. Shell is leading the negotiations on behalf of the entire oil industry, including Exxon Mobil, BP, Marathon and Tesoro. With the 1,100 members at the Whiting refinery and 340 at Toledo’s, the total number of striking workers rose to more than 4,900, who process 13 percent of the country’s oil. A full strike could stop 64 percent of oil production. The workers’ demands center on health and safety issues, contracting jobs out to non-union workers and health care. Oil producers have used the falling price of oil as a rationale to slash spending even though their profits remain grossly high. Steelworkers International Vice-President Gary Beevers, head of the Steelworkers National Oil Bargaining Program, said this reckless corporate behavior has forced the strike. “This work stoppage is about onerous overtime; unsafe staffing levels; dangerous conditions the industry continues to ignore; the daily occurrences of fires, emissions, leaks and explosions that threaten local communities without the industry doing much about it,” he said. 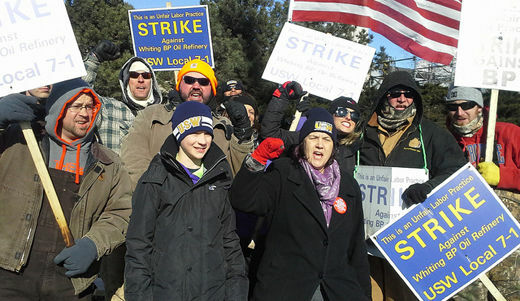 Union members are picketing at 14 gates at the Whiting facility, union official Robert Lofton told peoplesworld.org, Feb. 12. “But not the contractors’ gates,” the official said, as the union is not allowed to picket those. It is through those gates BP plant officials smuggle in “scabs” (workers who refuse to honor a strike and take the striking workers’ jobs) in vehicles with heavily tinted windows. Lofton, who has 20-some years in the plant worries that whoever BP is bringing in may not be qualified to safely run the plant. “Anything could go wrong,” he said. However, Chicago-based union and community activists could clearly be seen through the windows of the half dozen cars and vans making up a Feb. 12 solidarity convoy organized by Jobs with Justice. 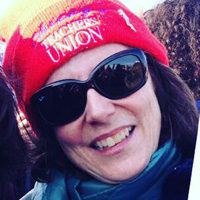 Among the union, retiree and community activists from the teachers, electrical, steel and auto unions were two firebrands from the Coalition of Labor Union Women. “Stay strong and don’t give up what my generation fought for,” said 96-years-young Beatrice Lumpkin, who then introduced her younger CLUW sister, Katie Jordan, 86, to also say a few words of solidarity. “Why thank you. I’d like to shake your hand,” said Mike, one of the strikers in charge of tending the oil barrel fires keeping picketers from freezing during their four-hour shift. “This shift I’m the barrel watcher,” he said. Mike lives close by, like many of the refinery workers. “If it was warmer I could ride my bicycle,” he said. When you live so close to a refinery, safety is not limited to a workplace and union issue, it becomes a community one. That is one reason why many local officials, police and others support the union in this fight. It’s a cruel irony to see piles of firewood stacked next to strikers who produce more than 400,000 barrels of fuel per day. The cords of wood, like the cases of bottled water and boxes of pizza, are shows of solidarity, the lifeblood to all working-class actions and wearing the smell of sweet scented smoke becomes a badge of honor. Workers at this BP refinery process the oil into “your gold, silver and premium grades” and into jet fuel, which is then transported via pipeline to O’Hare International Airport. Tar sands are also transformed into usable fuel here. Petcoke, once considered a byproduct of the operation, is now stored nearby in Koch-owned facilities. As it waits to be shipped to market, the toxic particles get blown around the residential neighborhoods, causing noxious dust storms that settles on playgrounds and cars and inhaled by all around. Steelworkers Organization of Active Retirees (SOAR) activist Scott Marshall told the picketers that a “blue-green” alliance between labor and environmentalists is taking shape in support of the strike and issued a statement of support. “They basically said you guys are the frontline for defending communities and making sure that this stuff is done as safely as it can be,” he said. 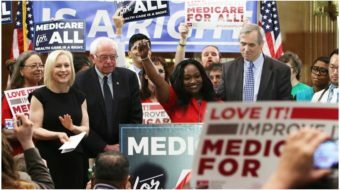 The statement came from Labor Network for Sustainability and its executive director, Joe Uehlein, underlined the importance of mutual solidarity between environmentalists and workers in both the fight on climate change and the ravages of the fossil fuel Goliath. After the Deepwater Horizon disaster in 2010 that killed 11 workers and spilled tens of millions of barrels of oil into the Gulf of Mexico, BP has become the poster child for Big Oil’s disregard for workers and the environment. USW Local 7-1’s Lofton said there is not much sympathy among the public for oil companies. “They are not well liked,” he said.